We are very selective, but always open to new French clock listings. 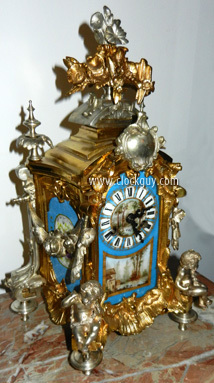 We have not had a Boulle-influenced clock for quite awhile. 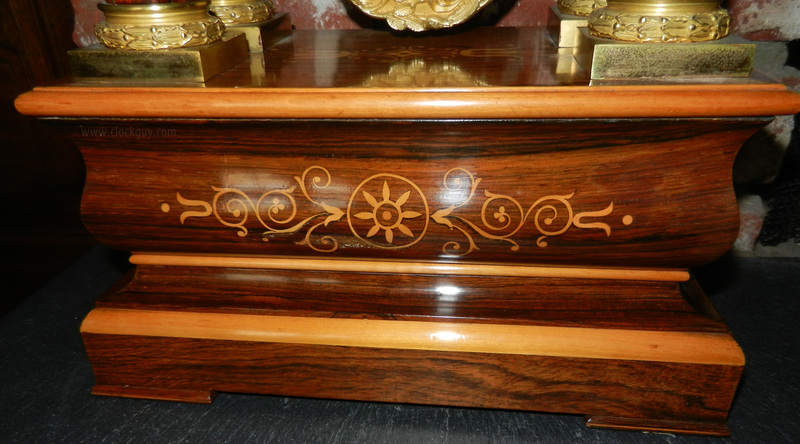 Most of them that are offered to us have lots of inlay missing or loose. 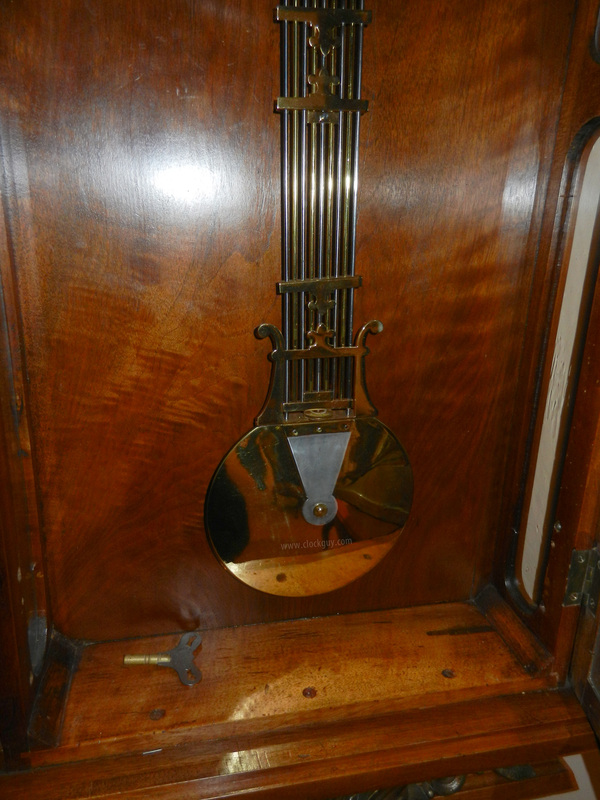 Here's one that's in absolutely spectacular condition and is sure to steal the show wherever it is placed. Note the convex glasses both top and bottom. It is absolutely amazing to us that the lower glass, which is virtually irreplaceable has survived since 1880! 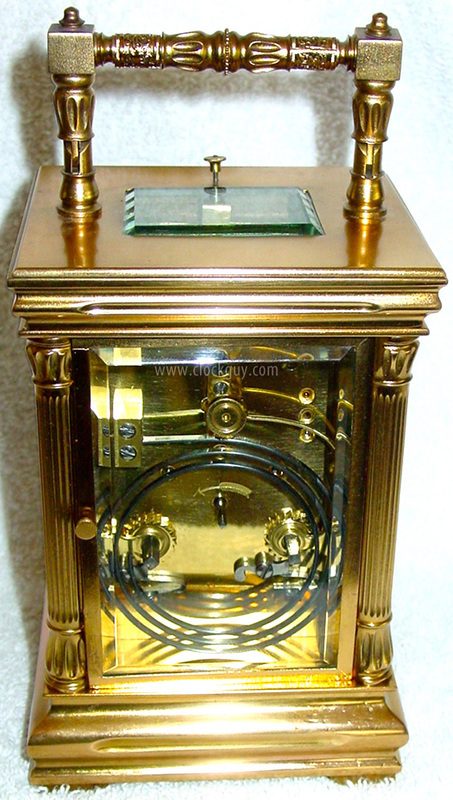 Physical: The stunning case, which measures 28"h x 9.5"w x 5"d, is in excellent physical condition. Glasses are original and in excellent condition. 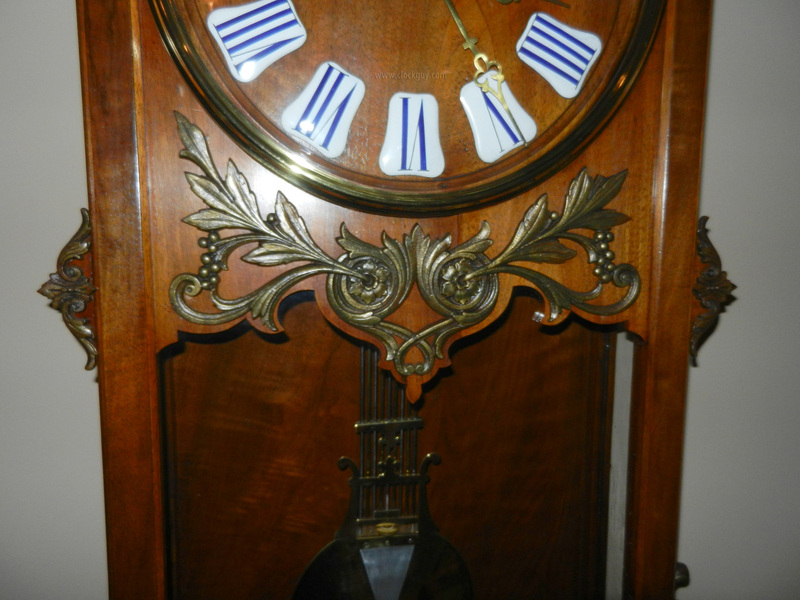 The porcelain dial and filigreed hands are also original and in excellent physical condition as is the cast brass "sun" pendulum bob. 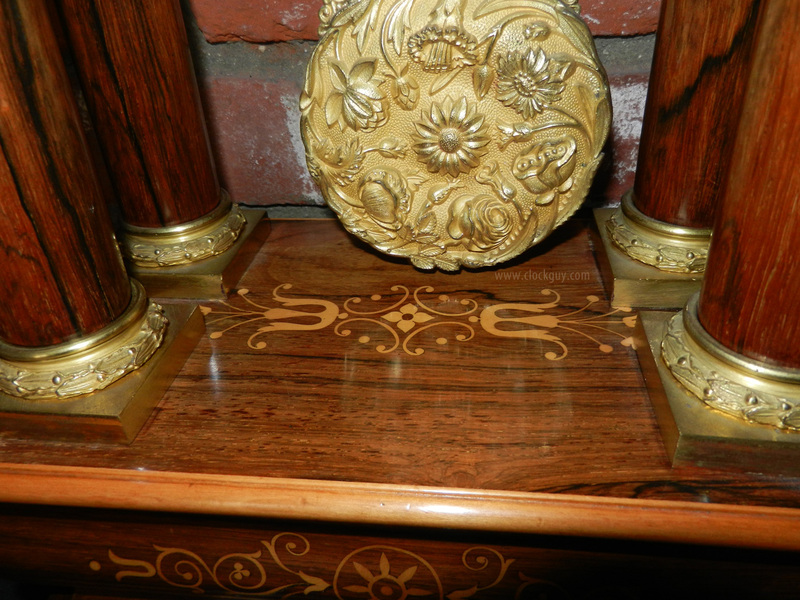 The cast brass mounts are original and all are present. Mechanical: The eight-day bell-strike movement has the Vincenti signature stamp behind the bell. It has been professionally overhauled and is in excellent mechanical condition. Comments: Are you ready for a bright-shining star in your home? That's what this alluring clock will be. All you have to do is call us, then figure out where it will be placed. According to Wikipedia, the cartel clock, incorporating clock case and bracket in a single unified organic sculptural conception, was a Rococo–era invention initiated in Paris that was popular through the 1740s. 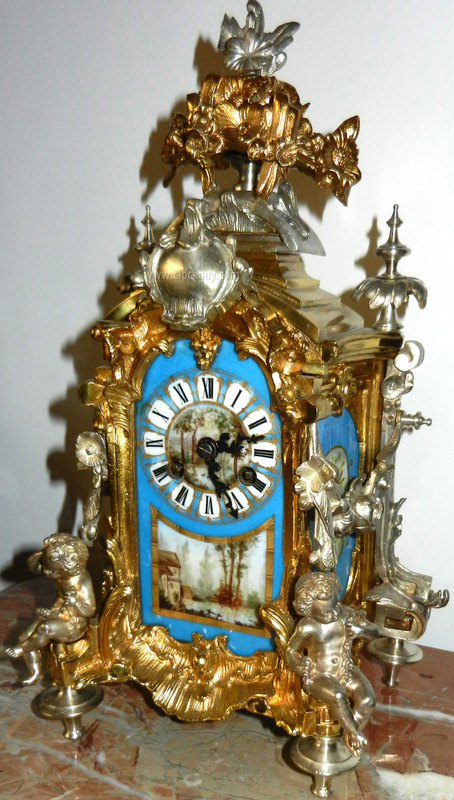 This particular clock was made circa 1900 when “reproductions” of earlier clocks, including cartel and lantern clocks, were all the rage in Paris. 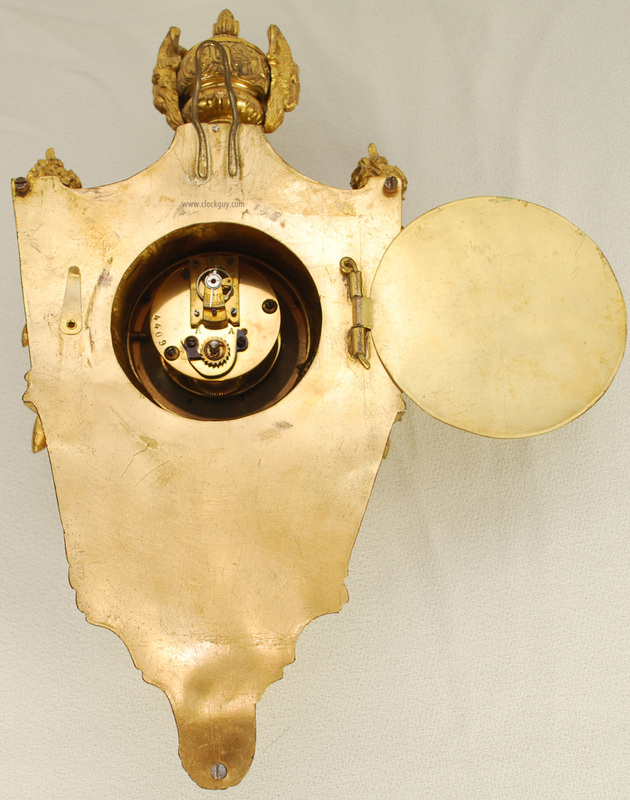 We own one of the lantern clocks of the 1890 era. 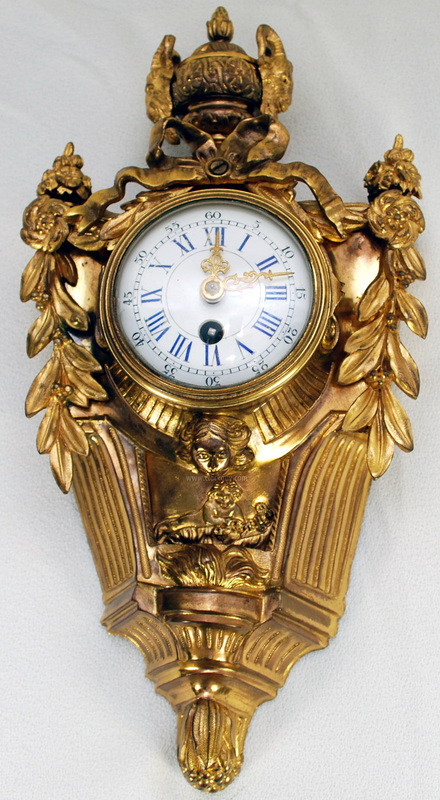 Cartel clocks in general have long been prized by higher-end collectors of French clocks. But most of them are quite large and extremely expensive. 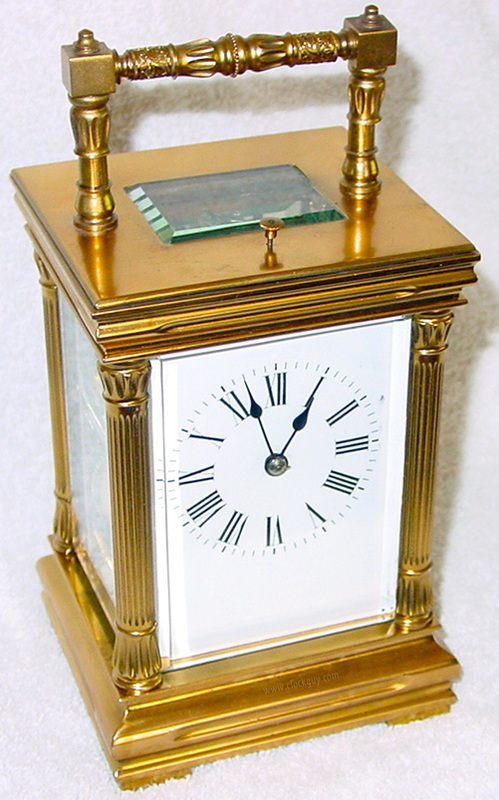 We are delighted to present this petite cartel clock for your consideration. 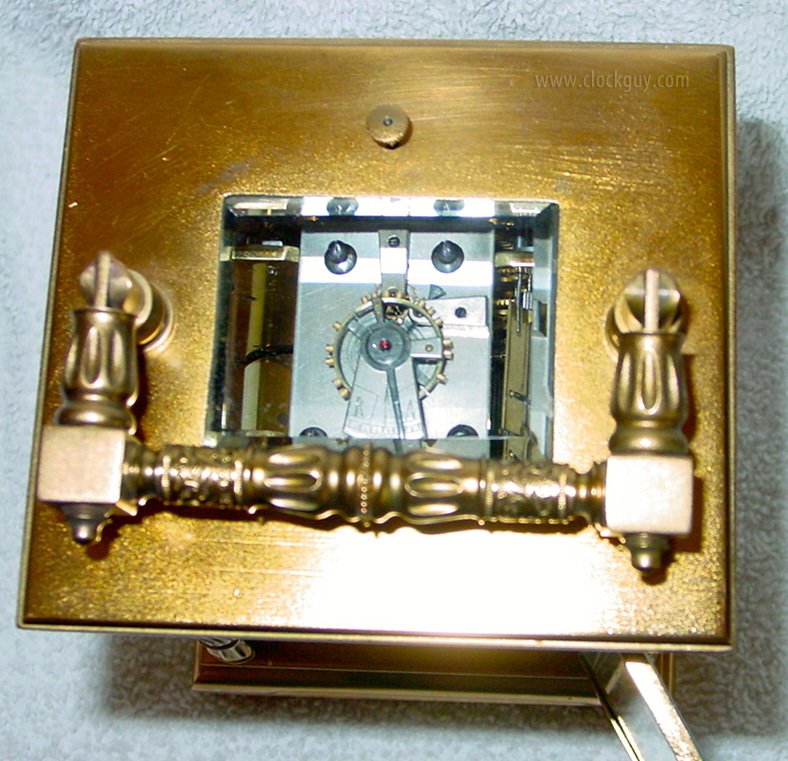 Be sure to look at the amazing detail in the brass case work. Then take a look at its very reasonable price! Physical: The case, which measures 10.75"h x 5.5" w 2.5"d is in excellent physical condition. 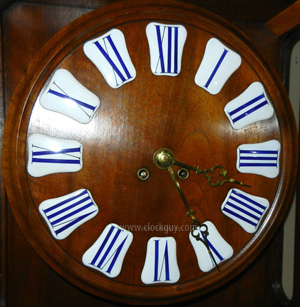 It features blue numerals hand-painted on a white porcelain dial, all of which is in great condition, too. Mechanical: The eight-day balance-wheel movement has been professionally serviced and is in excellent running condition. Comments: Gotta love this petite little beauty. 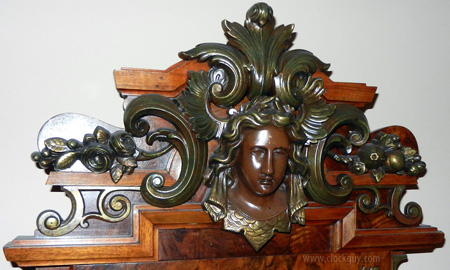 It will make a classy, but not overpowering statement wherever it hangs in your home or office. Maybe on the formal dining room wall somewhere in a grouping? It's definitely a reminder of a more kinder, gentler time in the past. Here is a wonderful architectural case with bamboo influences. It is French in origin, but not marked, so it predates the Paris Convention for the Protection of Industrial Properties (1883). 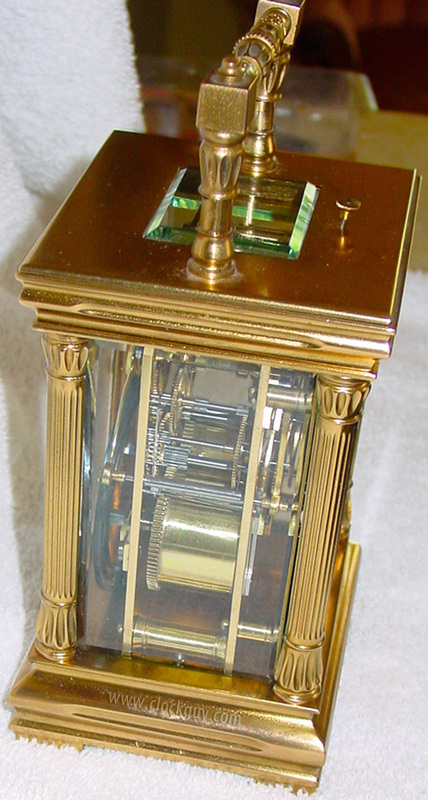 Physical: The 24k gilded brass case measures 5.75"w and 7.75"h counting the handle. 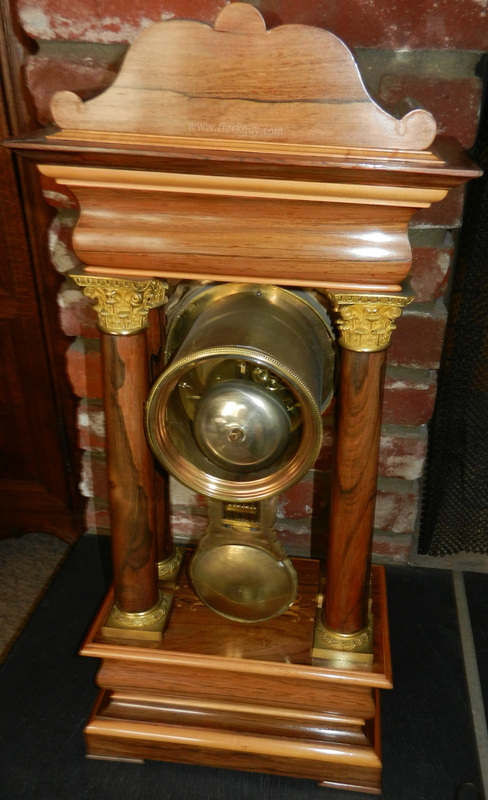 It was recently completely disassembled, re-plated and reassembled by a top restorer. 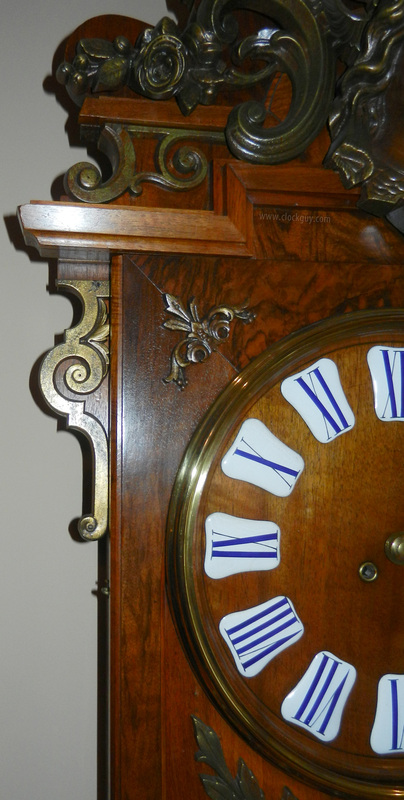 The porcelain dial with spade hands has no visible flaws, though there are tiny chips on both bottom corners that are not visible from the front. The 5 beveled glasses are also in excellent physical condition. Mechanical: The eight-day gong-strike repeater movement was recently professionally overhauled and is in excellent running order. 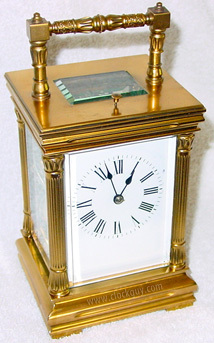 Comments: Elegant little clock ready for the bedside or on a special display shelf. Give us a call to bring this charmer "home"! 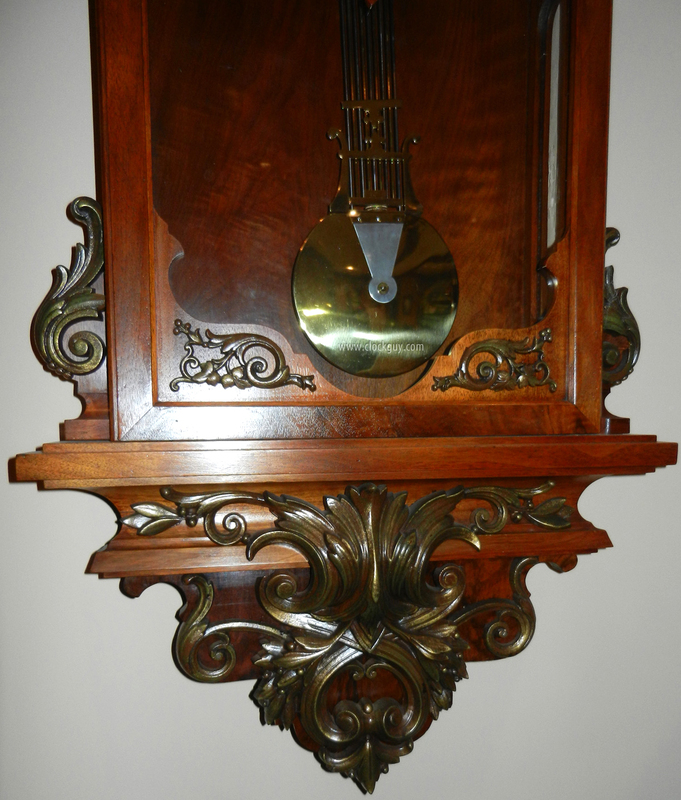 We are fortunate to have a continual stream of interesting clocks offered to us. We choose only the cream of the crop for listing on our website. 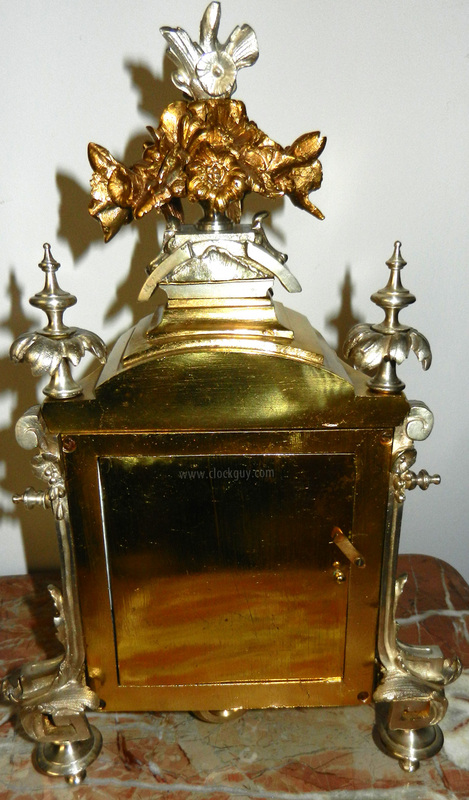 This one with a beautiful maiden crown (of gilded and colored iron) is certainly from the top layer of the cream! Physical: The walnut case with iron mounts, which measures 21"w x 58"h x 5.5"d is in excellent original condition with the original finish. 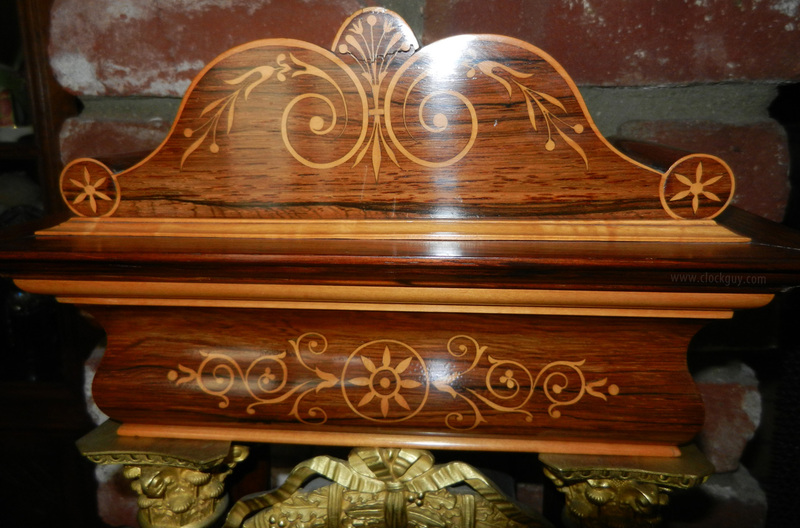 The case has been cleaned thoroughly and waxed and is completely original. 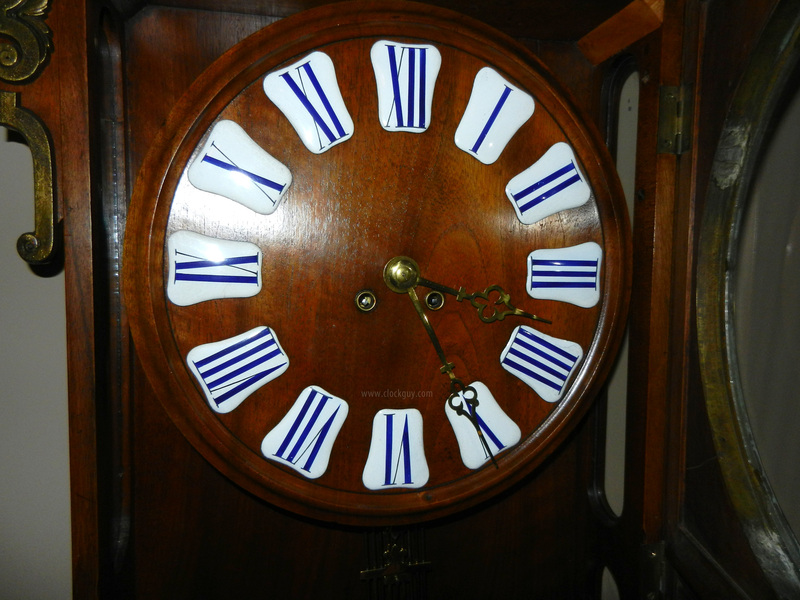 The 12" diameter walnut dial features porcelain "cartouches" with blue numerals and original brass hands. Mechanical: The eight-day, time-and-strike movement has been overhauled by a top horology professional and is in excellent running order. Comments: Have you been looking for a clock that will make a really grand statement, perhaps on a wall in your dining room or den? Here it is! We seem to be on a roll lately for finding great French clocks. This one is no exception. 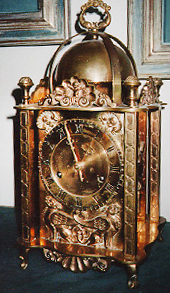 Most "empire-style" French clocks that are offered to us are either battered, 30-hour versions, or a combination of the two and thus never make it onto our website. This one is a great exception. It is distinguished not only by being beautiful, but by a 21-day movement and an exceptional dial that has a usually-not-present seconds bit. 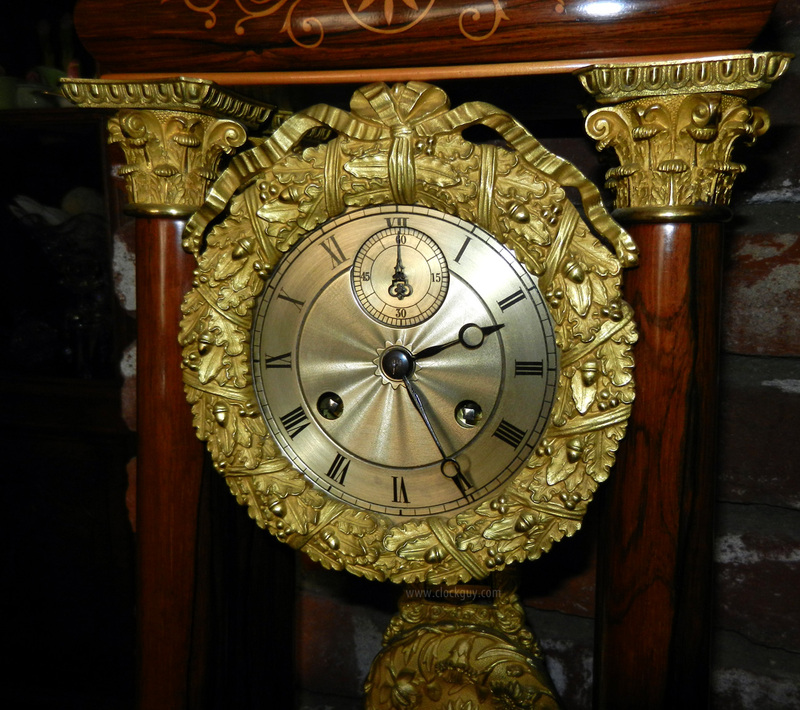 This clock also features beautiful cast capitols and bases as well as an exceptional and ornate cast brass bezel and pendulum. 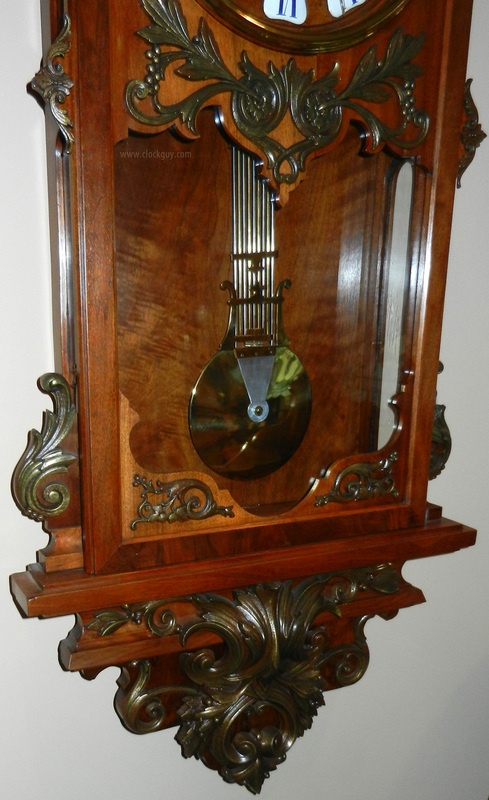 Physical: The rosewood case with satinwood edging and inlay measures 10.5"w x 24"h x 6"d. Our consignor has owned this clock for 25 years and believes the prior owner may have had the case refinished at some point; it looked great to us when we took the photos. 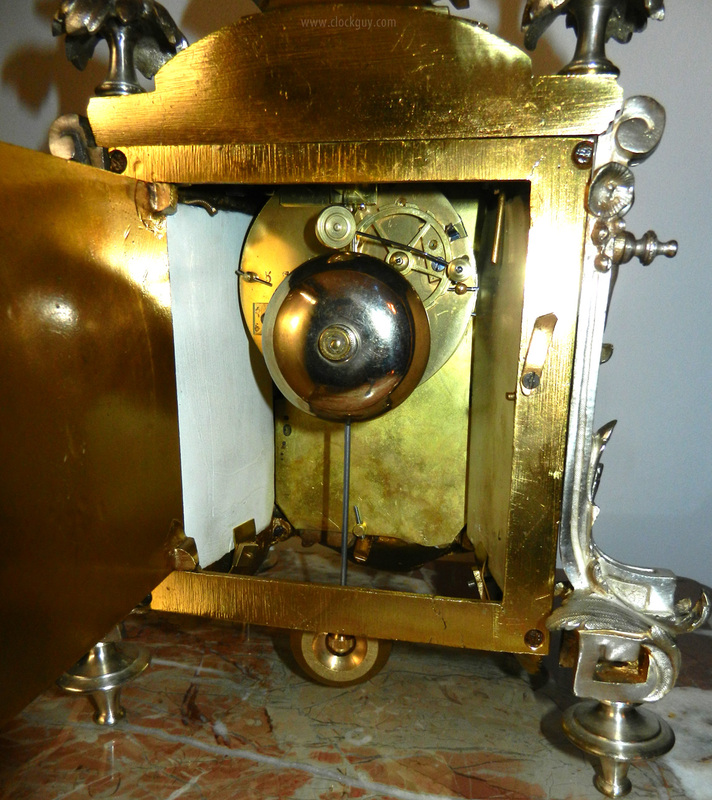 The photo reveals a small crack in the top center of the crown that we did not notice standing in front of the clock. The silvered dial is in excellent condition and measures 4.125" in diameter. 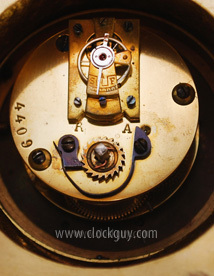 Mechanical: The movement is in excellent running order, owned and maintained by a master technician. As mentioned above, it is most unusual in that its running duration is 21 days and it also has a seconds bit. 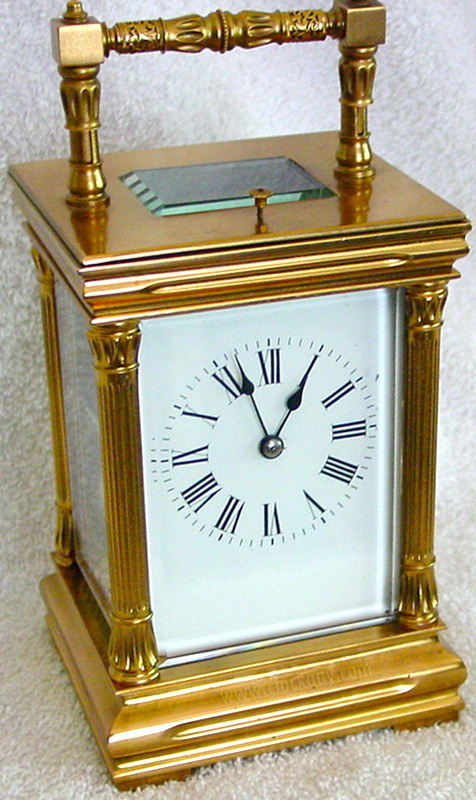 Comments: Seeking a very formal-looking clock, perhaps for a buffet in your dining room, or on a library shelf in your den? This would make a great contribution to the decor of any room. Call us to begin the process. 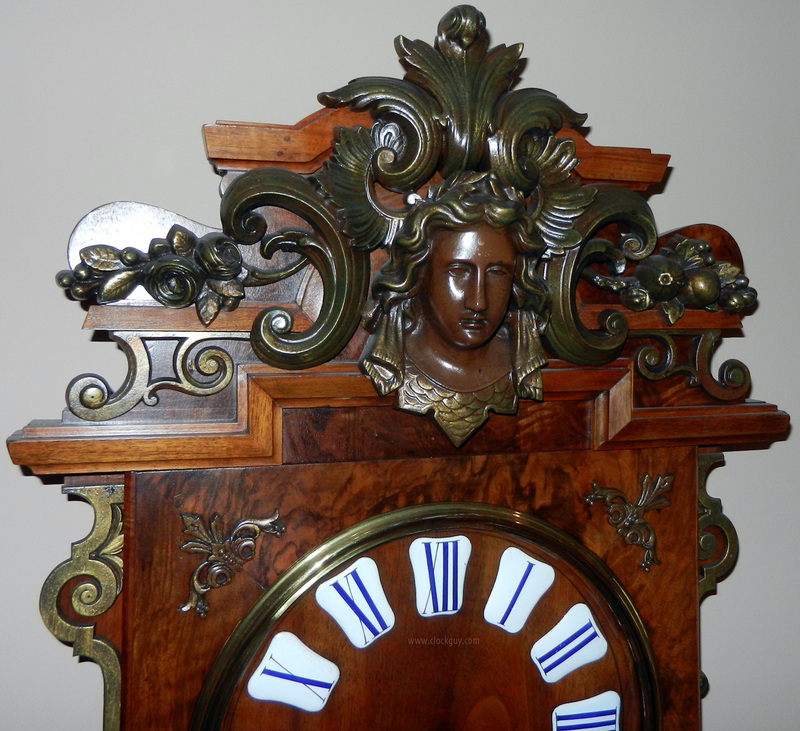 This is one of the exceptions to our "be careful which French clocks you list on your site" internal rules. So many of them are either in sub-par condition or are so pedestrian in style that they are not a good fit for our clientele. 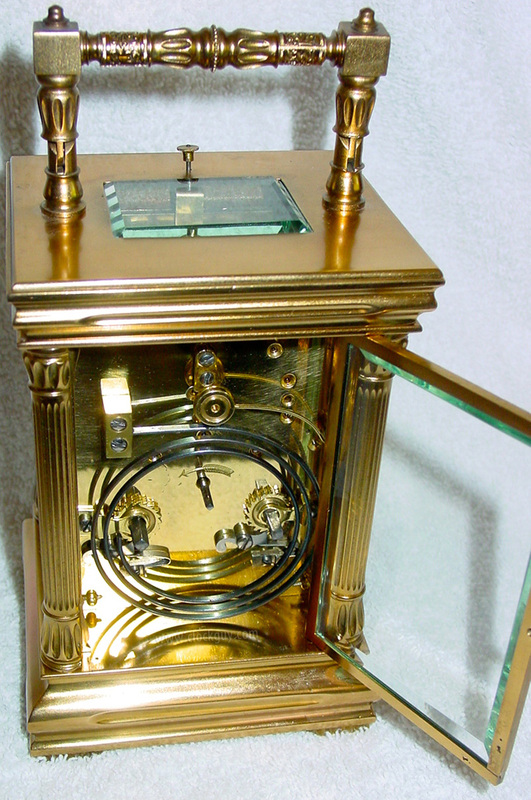 This tiny little clock is a wonderful exception to that rule. 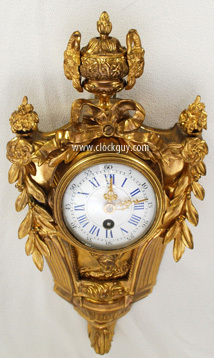 We don't personally collect "frilly" clocks, but this is one that we personally find very desirable. Take a close look at the detailed photos below. 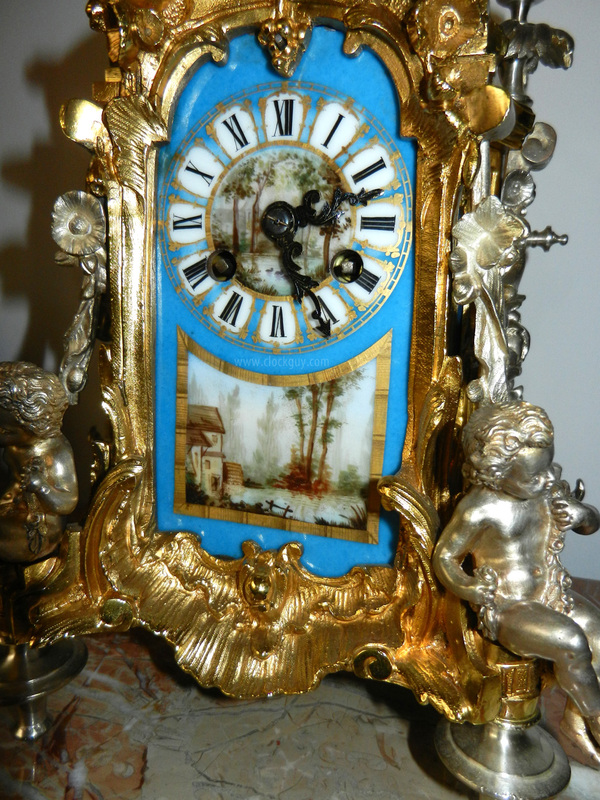 Physical: The gilded and silvered spelter case, which measures 8"w x 13"h x 5.5"d features a cherub and floral three-dimensional motif and a pastoral country scene on hand-painted porcelain panels below and inside the dial as well as on the two side panels. The consignor believes the side panels may have been repainted at some point in the past. 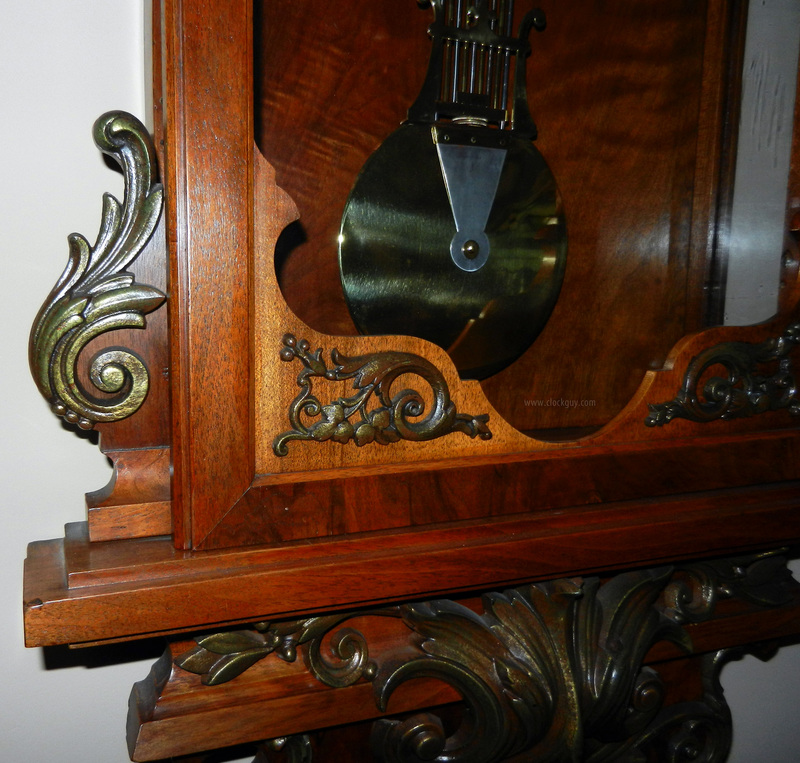 The clock is in overall excellent physical condition. Mechanical: The eight-day countwheel time-and-strike movement was professionally serviced by one of the top technicians on the West Coast in 2011 and is in excellent running order. Comments: This is a captivating-looking little clock. Make it your own?